I once read an extended interview with Larry Cohen that arguably taught me more about low budget filmmaking than the three years I spent studying film at college. Cohen is one of American cinema's great multi-hyphenates. 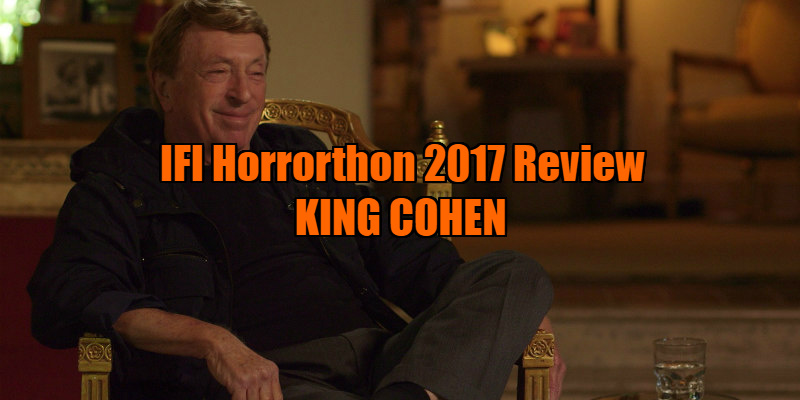 As pointed out in Steve Mitchell's documentary King Cohen (subtitled 'The Wild World of Filmmaker Larry Cohen'), he became a director to protect his writing, and ultimately a producer to protect his directing. Cohen worked in a manner similar to Ed Wood, shooting on crowded city streets without permits and working within the confines of extremely tight budgets and schedules. The difference of course is that Cohen managed to make good movies with such practices. Mitchell adopts a loose cradle to present day format for his doc. Many filmmaker docs tend to start with their subject's key period, but King Cohen refreshingly devotes a good amount of time to Cohen's early days working in the true golden age of TV, the '60s, when he contributed to a slew of hit shows, and created several himself, like The Invaders, Branded and Coronet Blue. Cohen's real purple patch came in the '70s and '80s, when he struck out from Hollywood and self-produced his own movies, becoming the very definition of an indie auteur with movies like the It's Alive trilogy, God Told Me To and Q: The Winged Serpent. Mitchell assembles all the key surviving players from this period, including the great Michael Moriarty, the John Wayne to Cohen's John Ford. Fred Williamson, star of Cohen's blaxploitation entries Black Caesar and Hell Up in Harlem, provides some of the funniest moments in a doc that's full of them with his recollections of Cohen's unconventional working practices. New York may be synonymous with filmmakers like Woody Allen, Martin Scorsese and Abel Ferrara, but nobody shot the Big Apple quite like Cohen, who working without permission of course, would get down to street level, shooting complex and dangerous set-pieces on the streets of Manhattan. Whenever you see bystanders panicking in a Cohen movie, you know those are genuinely scared citizens who think they're actually witnessing a shootout or some other fracas. One of the doc's highlights arrives when Cohen and his cohorts come clean about the many laws they broke to pull off such stunts, including disrupting John Landis' Trading Places shoot when every available NYPD officer was called to the Chrysler building in the belief it had been taken over by terrorists - false alarm, it was just Cohen and crew shooting the finale of Q: The Winged Serpent. King Cohen's greatest asset is the presence of Cohen himself. There are some filmmakers who talk a great game (cough "Eli Roth") but make terrible movies, but Cohen is a true entertainer, both as a filmmaker and a talking head. He's captivatingly witty in the way only Jewish New Yorkers of his generation are, and at 76 he's as energetic as ever. Those in attendance at the film's screening at the Irish Film Institute's Horrorthon had the bonus of a recorded intro from the great man, who credited his storytelling skills to his grandmother. Cohen's spirit lives on in the likes of The Safdie Brothers, who similarly exploit the sights and sounds of street level NYC, but in the modern world we'll never see his like again. 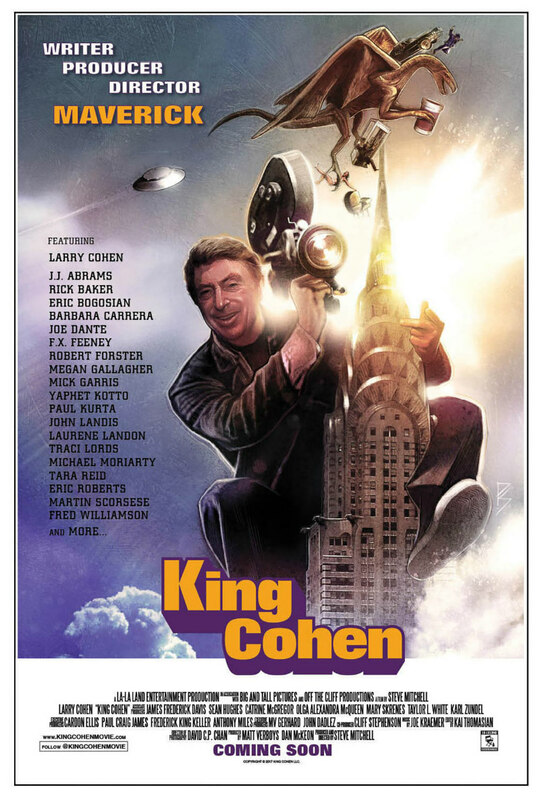 King Cohen is an in-depth and loving tribute to a true legend of low budget cinema. It's also one of the most entertaining filmmaking documentaries you'll ever see.